There are many home improvement contractors serving the Phoenix, Arizona, area, but how do you know which one can be trusted to perform high-quality renovations at your home? The first thing to consider is the range of products that are available. For instance, if you want a bathroom made for luxury, you want to make sure that you’re getting the most for your investment with modern products such as a steam shower, a splash wall, and touchless faucets. The next thing to consider when paring down your list of home improvement contractors in the Phoenix, AZ, area is their reputation for customer service. Search for any awards or industry recognitions such as a high rating with the Better Business Bureau that will speak to their level of professionalism and dedication to performing flawless installations. You’ll also want to choose a contractor that will listen to your wants and needs and bring their own design ideas to the table to create a redesign that will truly leave you breathless. After all, it’s your house that’s being renovated and your money that’s being invested – why shouldn’t you have the bathroom or kitchen of your dreams? Homeowners in Phoenix, AZ, and surrounding areas can turn to Premier Kitchen & Bath for a flawless home renovation. 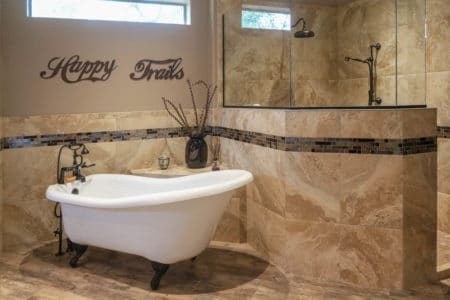 What sets us apart from other home improvement contractors is not just our A+ rating with the BBB but also our design process, where our designers will take your ideas and improve upon them in ways you may not have thought of. Through a series of planning and refining consults, we’ll ensure that all your wants and desires are included in the makeover, as well as other additions that go beyond what you thought was possible. To learn more, contact Premier Kitchen & Bath today.